Torrington’s “Little Sister of Liberty” has stood since November 11, 1950. 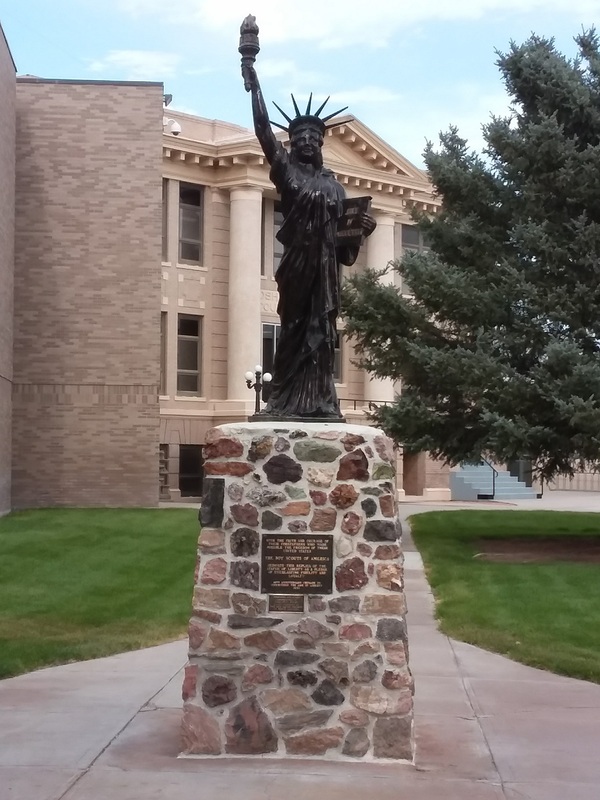 Located on the south lawn of the Goshen County Courthouse, it was one of 200 statues placed across the nation to commemorate the 40th anniversary of the Boy Scouts. What makes the Torrington statue truly one-of-a-kind is the remarkable construction of its base. Charter members of the Rex Young Society of Rock Hounds donated rocks, gemstones, minerals, and fossils for the pedestal. Over the years, Torrington’s statue fell into disrepair. But in 2017 our Little Sister of Liberty was refurbished. Her hail-damaged crown was repaired, highlights were added, and a protective coating was sprayed on to seal out tarnish and discoloration. The base was cleaned, and the old mortar repointed. 325 rocks – most of which originated in the Hartville Uplift and other parts of eastern Wyoming – were identified and catalogued. Lighting was added to the area as well.